This Week In Bots: Robot Squirrels, Amoebas, Pilots, And… Guilt? There is more innovative robo-news this week than you can shake a (programmable, artificial) stick at. Trust us, we tried. Working with wild rattlesnakes is not exactly the safest or simplest job in the world. It’s harder to study them in a realistic enviroment than friendlier, less fang-y animals…like squirrels. Oddly enough, Northern Pacific rattlesnakes actually do like squirrels (for lunch). That’s why a research team recently built a robot squirrel that, while crude-looking to human eyes, is so realistic, down to emitting the right kind of sounds and flicking its tail in ways that match genuine squirrel behavior, that it provokes the snakes to attack. Scary, and wonderful. Speaking of risky work: One of the most dangerous jobs in the world has to be that of hand-guiding fast jets down to deck landings on aircraft carriers. But whither these bold, dayglo-suited folk when more carrier aircraft are robotic drones? They’ll still have a job, it turns out, thanks to research by MIT boffins into using advanced spatial sensors (like Kinect) to scan human gestures. The research is tricky because it means the drone’s flight computers will have to interpret a complex and dynamic set of gestures that change fast, and react accordingly. Why do this though? Having human feet and eyes on the pitching, rolling deck, along with an acute awareness of other on-deck activity makes a person better at this job than an automated system. Scientists at Cambridge University may not be short of cash, but a team there is using a fabulously low-cost and cute robotic solution to help them in their research into making artificial bone: Lego’s Mindstorms robotics set. A cheap, cheerful, and remarkably efficient solution. Robot swimmers. Liquid robotics plucky automated, wave-propelled robots are on an epic quest to swim the world’s oceans, and they’ve just set a record: Swimming more than 3,200 nautical miles across the Pacific Ocean from San Francisco to Hawaii–a journey that took four months. The ultimate goal is to gather unique data about seawater quality and composition. The four robots made the journey as a group, and now they’ll swim on to Japan and Australia in groups of two. 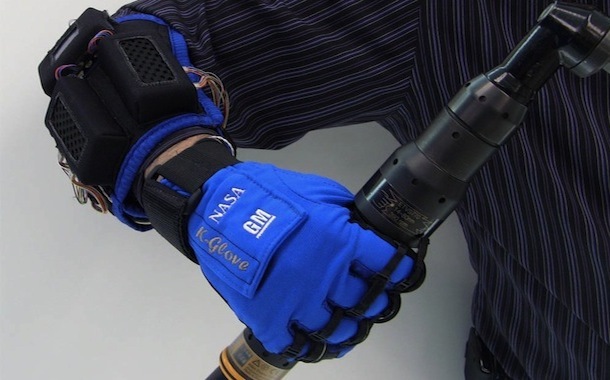 Robot glove for astronauts. Robonaut may be working in space right now aboard the ISS in the very early stages of his mission, but already there’s a spin-off from his technology: A robotic glove being jointly developed by NASA and General Motors, the Human Grasp Assist or “robo-glove.” The idea is to enable astronauts to grip and manipulate objects they either couldn’t, or wouldn’t be able to hold for too long due to fatigue. Instead the robotic finger-assisting grip, with clever sensors, will take up the load on future construction and repair spacewalks that require a more dextrous human touch. Canadian Space Bot DEXTRE. Canada-made robot manipulator DEXTRE has just finished a successful test aboard the International Space Station: In the first of six experiments, it simulated some of the tasks needed to remotely refuel a satellite. In the long run, this task could be a critical one (and a valuable one) for robots, enabling satellites to have more productive, longer lives…or to be launched with lower mass, thanks to partly empty fuel tanks, to save on cost. We may not yet be living in an era when robots impact our daily lives (unless you consider the bodyless voice of Apple’s Siri as a semi-artificially-intelligent robot), but there’s a growing move to consider the ethics of robot-human interactions well ahead of this time. That way, we’ll be able to design the robotic systems with the right kind of smarts so that there are no misunderstandings, accidents, or complicated or disturbing legal questions–like is turning off a robot murder? A new paper in the publication Proceedings of the IEEE sets out clear arguments on the matter, posing such questions as “How do we create robotic technology that preserves our humanity and our societies’ values?” and also probing into the ethics of using military robots as remote-controlled kiling machines, or even the sort of internal ethical decisions more intelligent military droids will have to face (remember that movie Short Circuit?). It’s all very thorny stuff, and more relevant than you may think–especially when you look at the exploding numbers of military robots in use right now, the increasing use of robots in medical care facilities, and drones operated by police forces. The paper proposes a kind of “ethical governor” system to be built into robots, including guidance limitations like the Geneva Conventions in war robots, for example. Robots may even need to have a programmed sense of “guilt” in order to stay within their ethical guidelines. And, interestingly, the paper notes that robots probably should be allowed to decieve humans–particularly in cases where it’s in the immediate best interests of the human involved, such as trying to calm them down in a rescue situation. This is not all science-fictional nonsense, either. Consider: How comfortable are you with the idea that a robot will be performing some of the health care assistance tasks for your granny’s hospital trip in just a few years? Would you trust a robot classroom assistance to respect your young kids’ needs and privacy? No need to respond right now–take the weekend to think about it.